class="page-template-default page page-id-46 wpb-js-composer js-comp-ver-3.6.12 vc_responsive"
Neel Jani was born on December 8th in Rorschach, Switzerland to an Indian father and a Swiss mother. Neel’s parents have been the cornerstone to his career, providing him with encouragement, support, natural and the determination to win which comes from a perfect blend of the Swiss need for perfection and the Indian will to succeed. Neel’s career was launched in 1996, at the tender age of 12, when his father enlisted the rambunctious young boy into karting’s mini class. Over the next four years, the young talent quickly advanced through the ranks, impressing many with his natural talent and picking up many race wins along the way. In 2000, aged 16, Neel advanced to single-seaters, becoming Swiss Champion of Formula Lista Junior in his rookie year, winning 8 races and finishing second 4 times in 12 races. In 2001, he contested the Formula Renault 2000 Eurocup, whilst also participating in a number of rounds of the Italian Formula Renault series. He remained with the Formula Renault 2000 Eurocup in 2002, finishing second in the European –championship, winning 3 races out of 9. Aged 19 in 2003, Neel moved up to the Formula Renault V6 Eurocup, finishing second in the championship, while also taking part in his first F1 test with Swiss team Sauber-Petronas at what was considered to be, at that time, a very early stage in any drivers career. In 2004 he shared his time between the Formula Renault V6 Eurocup, shifting to the DAMS team where he attained 9 poles and 5 race wins; one round of the FIA GT Championship; and another F1 test, this time for the newly formed Red Bull Racing Team. It was Neel’s skilled performance during this test that finalized his place in the Red Bull Junior Team. Advancing again in 2005, Neel stepped up to the newly formed GP2 Series. During this season of his career the world of motor sports viewed a continued exhibition of great expertise, including two wins at the Hungaroring and Monza, and a spirited performance at Nürburgring where Neel fought to hold the lead in a clearly slower car for the majority of the race with a show of remarkable defensive driving. In late 2005, Neel represented Switzerland in the inaugural season of the A1 Grand Prix World Cup of Motor Sports. Following some excellent performances, he finally broke the French team’s stronghold on the championship by taking a well-deserved win in Dubai, ultimately finishing second in the championship with 11 podiums. During the 2006 season, as part of the Red Bull Junior Team, Neel was named as test and third driver for F1 Team Scuderia Toro Rosso. Alongside his F1 obligations, Neel replaced injured Nicolas Lapierre for two races in GP2 at Silverstone and Magny-Cours, where he secured his place in the record books by being the only person to ever drive in both GP2 and F1 on the same day! In 2007, Neel took the opportunity to get back into a full-time race seat, driving in the US for PKV Racing in the Champ Car World Series, collecting 3 podiums and numerous top ten’s in his rookie season. Winter season 2007-2008, Neel once again concentrated on winning the elusive World Title in the A1 Grand Prix World Cup of Motorsports; achieving this goal in emphatic style, with 4 victories, 11 podiums, 6 pole positions, and 5 fastest laps. In 2008-2009, Neel returned to A1 Grand Prix and finished as Vice World Champion in what was a much shorter season, equaling his previous seasons tally of 4 victories. Later in 2009, Neel took part in his first 24 Hours of Le Mans race in LMP1, where he and teammates, Nicolas Prost and Andrea Belicchi, were running in the top 6 just behind the Peugeot and Audi factory teams, when an unfortunate gear box failure took them out of the race just 2 hours till the chequered flag. 2010 was Neel’s first full season in LMP1 endurance racing where he teamed up with Nicolas Prost and Rebellion Racing in the European Le Mans Series, achieving 2 Podiums and a 3rd place finish in the championship. Alongside his full-time sports car ride, Neel continued to honor his commitments with Red Bull Racing, completing simulator and aero testing for the F1 team. In this testing capacity, Neel completed an aero test in Spain – trying out the newly developed F-duct, and successfully assisted the team in Milton Keynes, with real-time simulator laps on different set-ups to assisting Red Bull drivers Vettel and Webber to qualify P1 and P2 at the Melbourne GP 2010. Mid-season 2010, Neel was drafted into the GT1 World Championship to replacing Olivier Panis/Natacha Gachnang for the Matech Ford GT team during the final half of the season. Rounding out a full and varied season, Neel showed his talents in single-seaters once again with Superleague Formula where he stepped in at last minute for the injured Chris Van Der Drift with team Olympiacos and claimed a debut win with a 10 second lead in race 2. As promised, 2011 was another entertaining season for Neel’s supporters and race fans alike. Putting his focus fully into the International Le Mans Series with Rebellion Racing, Neel helped the team claim a 6th place overall finish and best petrol car accolades at the 24 Hours of Le Mans, while finishing the season as the Le Mans Series Champion in LMP1 Teams’ title, courtesy of Neel’s pole position at the season finale race at Estoril in Portugal. 2013 has commenced with the announcement of Neel teaming up for his 6th season with Rebellion Racing. The Swiss team will be splitting cars and drivers between both the American Le Mans Series (ALMS) and FIA’s World Endurance Championship (WEC) for a combination of the best races in sportscars. 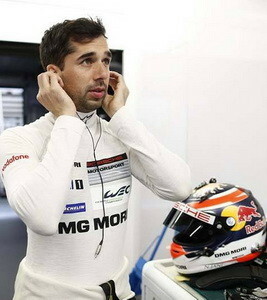 The 2014 season marked Porsche’s return to the top tier of motorsport and Neel’s first year as a Porsche factory driver. Porsche’s reappearance to the LMP1 scene was wrought with expectations, which were finally realised by Neel’s #14 919 Hybrid in the penultimate round at Sao Paulo. This historical win, along with two other podium finishes and three pole positions, lead not only to a third place finish in the FIA World Endurance Drivers’ Championship, but perhaps more importantly, a very successful new chapter for the history books. 2015 saw Neel and the Porsche team eager to continue their success from the previous season. The team did exactly that with a dominate display over the season, including their 17th win at the coveted Le Mans 24 hours with car #19 and the FIA World manufacturers title, just one year after their return to sportstcar racing. Neel’s role in this team success was pivotal. Despite difficult circumstances for the #18 car, Neel celebrated breaking the outright lap record at Le Mans, taking pole in the historic race, as well as at Nurburgring and Circuit of Americas. Neel, Romain and Marc rounded out their 2015 season with a well-deserved victory in the final round in Bahrain. In doing so, the trio of drivers managed to hold the #7 Audi at bay, allowing their sister car to take the FIA World drivers’ championship. With Porsche firmly at the top of sportscar racing, Neel and the team began 2016 in the best possible way with a win in the opening round at Silverstone. The performance continued in preparation for Le Mans with a pole position and 2nd place at Spa. Neel, Romain and Marc arrived in Le Mans as the championship leaders. Neel showed his love for the Circuit de la Sarthe, with a consecutive pole position. The great 24-hour endurance race of Le Mans did not disappoint, and went down to the wire, with one of the most historic penultimate laps ever. Amidst the drama and heartache, Neel, Romain and Marc took victory at Le Mans 24 hours. The early success of the season, was thwarted with some tough races and tested the resolve of the #2 trio. Despite this, Neel and his #2 team mates maintained their championship lead throughout the 2016 season to win both the FIA World manufacturers title and FIA World drivers’ championship.